There is an intricate dance I think most of us miss out on. That is the art of delayed gratification–or, in this specific case, letter writing and snail mail. Yesterday, a wonderful present arrived for me. I wasn’t expecting it, and that certainly added to the initial gasp-shock-love-dream-daze sensation. It’s a sensation I usually associate with making intense eye-contact with a brave, vivid personality. In the haze of it all, my mind struggled to catch up and rearrange the circumstances. 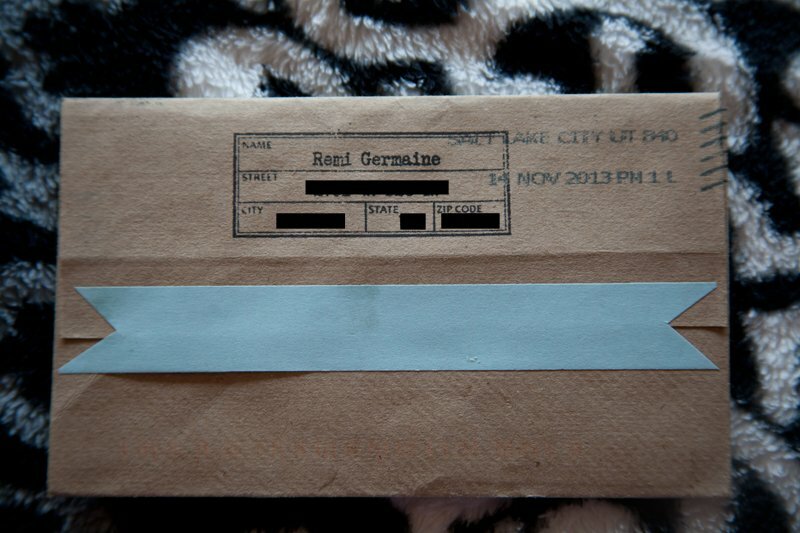 An epiphany: I had received my letter from Remi. One of my favorite Frida Kahlo quotes, penned by Remi. Back to the custom mailing envelopes, but where to begin? The penmanship. The collage. 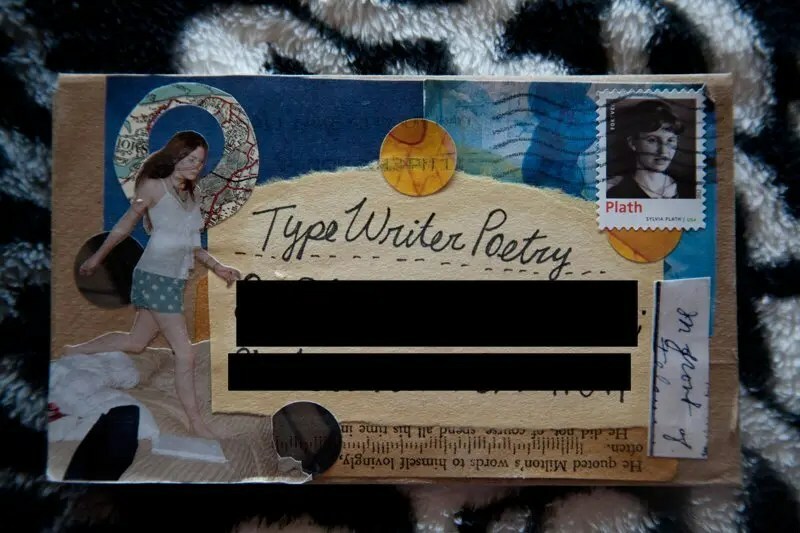 I love the fact that she used a Sylvia Plath stamp. A weathered piece from a book: “He quoted Milton’s words to himself lovingly, often.” Even though she didn’t know me, she took the care to cater to my loud and obvious raptures: words. I let the letter sit for a day, afraid to pierce through the recycled, paper bag envelope. It was made with such care, I didn’t want to ruin it. Inhaling it, letting it fold against my hands, I was transported back to being a kid at my own birthday party. I remember being taken by that special present, the one that wasn’t haphazard in presentation. A touch of ingenuity. You had to wonder about the adult who crafted such a specimen, what kind of life they lived outside this place. You’d scan the scene of average wrappings, and then–! Eyes upon a different mystery. Something that immediately offered a fantastic first impression. Tiptoeing for a closer inspection, the care would reveal itself like evidence: proper tape measurements, accurate angles. No residue. The lack of slack against eager fingertips. I won’t share the letter she wrote. I like keeping things private. However, I will say if you’d like Remi to be your penpal, I suggest you drop by her blog and say hello–A Peachy Keen Day–or simply fill out her Postable. I send letters every now and then to a few friends who no longer live in Los Angeles. I’m ashamed to admit I usually forget the opportunity for art is everywhere–including in envelope presentation. After receiving this letter, I will certainly be upping my own letter writing game. If you’d like to be penpals, please feel free to send me your information via Postable. I’d love the opportunity to engage in conscious creation and communication with you. I’m so happy that it made it to you safely! Thanks for all your kind words. I’m glad that I got to send you something. Nothing is better then a mysterious envelope in the mail! Hope you have a peachy keen day! I’m glad, too! And thank you once again. I’m writing your letter right now, and hope to send it to you by the end of the week! What a lovely surprise. Remi’s blog is ace. It’s true…I just got a letter from another friend a few days ago. It’s amazing the difference in intimacy a mailed letter is, versus on Facebook or texting. Hope the new year is treating you well, John! When I was younger, I wrote to a few penpals around the US and around the world. I never could keep it going for a long time, though. School would always get in the way. We should be penpals, if you’d like! What a fantastic envelope! Getting letters in the mail makes my day. Likewise. I’ve written to a few people and have got two or three responses back in turn. It’s always a delightful surprise that leaves warm feelings for the rest of the day. Femail! And handmade femail at that! Love it. Off to visit Remi now. You’ll have to fill me in on what “femail” is/means! I googled it but I didn’t get the gist of it.